A Russian Soyuz capsule carrying NASA astronaut Mike Hopkins and Russian cosmonauts Oleg Kotov and Sergey Ryazanskiy departs the International Space Station on March 10, 2014. Three spaceflyers have said goodbye to the International Space Station and begun the journey home to Earth. NASA astronaut Mike Hopkins and Russian cosmonauts Oleg Kotov and Sergey Ryazanskiy left the station in a Soyuz spacecraft at 8:02 p.m. EDT Monday (March 10; 0002 GMT on March 11), wrapping up a 166-day orbital stint. The Soyuz is slated to touch down in the central Asian nation of Kazakhstan at 11:24 p.m. EDT Monday (0324 March 11 GMT; 9:24 a.m. March 11 local time). The trio nearly stayed aboard the station for another day. Officials considered delaying the Soyuz' departure by 24 hours because of bad weather near the targeted landing zone, but they ultimately decided to go ahead with the original landing plan. 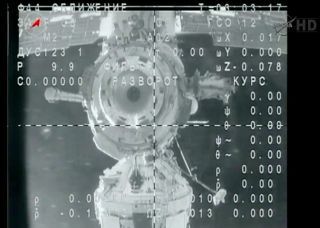 The departure of Hopkins, Kotov and Ryazanskiy brought to an end the orbiting lab's Expedition 38, which Kotov commanded. On Sunday (March 9), Kotov officially handed the reins over to Koichi Wakata, the first-ever Japanese astronaut to helm the huge $100 billion spacecraft. Wakata leads the new Expedition 39, currently a skeleton crew that also includes NASA astronaut Rick Mastracchio and cosmonaut Mikhail Tyurin. This trio will get a robotic visitor in a week or so, as SpaceX's Dragon capsule is scheduled to launch toward the space station Sunday (March 16) on its third cargo delivery mission for NASA. The International Space Station will soon be fully staffed. Another Soyuz is slated to launch March 25 from Baikonur Cosmodrome in Kazakhstan, carrying three new crewmembers — one NASA astronaut and two cosmonauts — to the orbiting lab.